This is a listing for one (1)Rare Hall’s Simplex Hektograph Black Ink. So charming! A great addition to your Black and White antique transfer pieces. Maling Stamp 425 on base. The stencil copying systems described above involved pressing or extruding ink through stencils onto sheets of paper. In the hektograph (also spelled “hectograph”) process, which was introduced in 1876 or shortly before, a master was written or typed with a special aniline ink. The master was then placed face down on a tray containing gelatin and pressed gently for a minute or two, with the result that most of the ink transferred to the surface of the gelatin. Gelatin was used because its moisture kept the ink from drying. Copies were made by using a roller to press blank papers onto the gelatin. Each time a copy was made, some ink was removed from the gelatin, and consequently successive copies were progressively lighter. In practice, up to fifty copies could be made from one master. Plate 33 is an 1876 ad for J. R. Holcomb & Co.’s Transfer Tablet hektograph. Plate 33B shows another hektograph, Lawton & Co.’s Simplex Printer, which was introduced by a predecessor company, General Copying Apparatus Co., by 1889. The Simplex was $3 to $29.50, depending on size. Yates (p. 122) reports that “By 1885 the [Illinois Central Railroad] Freight Office’s need for a neat alternative to printing had led it to adopt…the hectograph….Using a hectograph in the Freight Office, rather than sending the rate circulars to be printed, was faster as well as cheaper. And although the hectograph duplicating process itself was messy, the final products were neater and more readable than those produced with the Edison Electric Pen.” An 1887 ad stated that a hektograph could be used to make 15 to 40 good copies of a letter typed on a Hall index typewriter. Hektograph copiers were still marketed by the Heyer Hektograph Co. (founded 1903) in the 1950s. 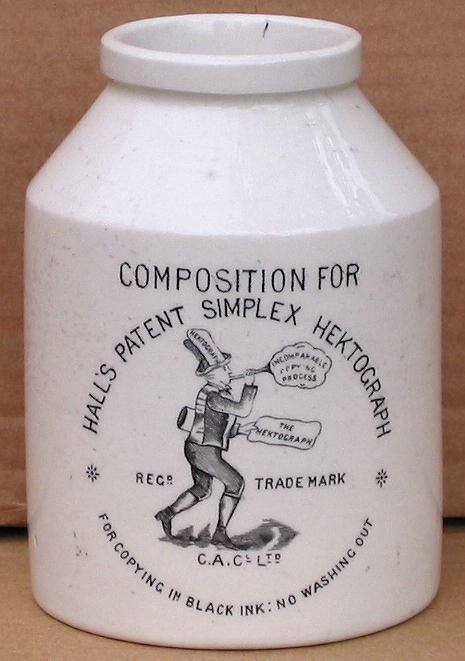 Plates 33C-D, Bottle for Composition for Hall’s Patent Simplex Hektograph, England. 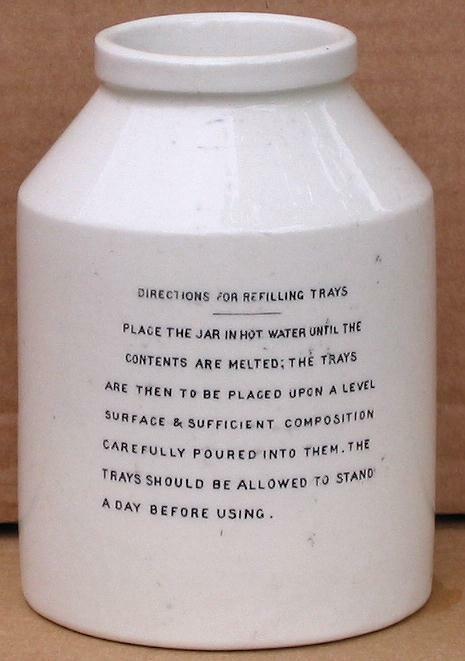 Photo below shows instructions on back of bottle. The images attached are for the pot you will receive. I have other pots listed if you prefer less aged patina.